Sebastian and Ravi's paper on engineering second generation bacterial light sensors is published in ACS Synthetic Biology! Jeff is featured in Business Insider in an article titled "Bacteria Could Provide A Powerful New Way To Fight Fat And Depression"! 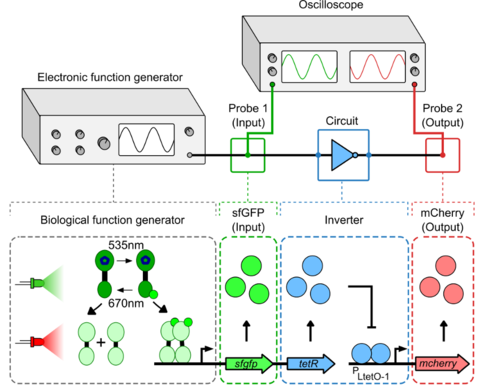 Evan's review paper titled "Optogenetic characterization methods overcome key challenges in synthetic biology" is published in Nature Chemical Biology! Jeff's interview with the LA Times outlines the goals for the recent ONR award to engineer synthetic probiotics for human health. Our paper Characterizing bacterial gene circuit dynamics with optically programmed gene expression signals wins Best Paper in the Department of Bioengineering for 2013-2014! Evan will be presenting the work at the 1st Annual Graduate Student Awards Symposium on May 12! Jeff was named a recipient of the 2014 Office of Naval Research (ONR) Young Investigator Award! The ONR Young Investigator Program is one of the oldest and most selective scientific research advancement programs in the country. Its purpose is to fund early-career academic researchers whose scientific pursuits show exceptional promise for supporting the Department of Defense, while also promoting their professional development. In other great news, long time friend of the lab and collaborator Georg Seelig from the University of Washington also received the award! Check out the press release here! Ravi Sheth was named Rice University School of Engineering Herbert Allen Outstanding Junior! Additionally, Ravi's poster placed in the top three engineering posters at Rice's Undergraduate Research Symposium! Congrats! Brian Landry was awarded the prestigious National Defense Science Engineering Graduate Fellowship (NDSEG)!! Congrats Brian! The lab was awarded a 3-year grant from the Welch Foundation to study the ligand binding properties of bacterial two component systems! Applications are now open for the 2014 Cold Spring Harbor Synthetic Biology Summer Course, and Jeff and Evan will be teaching again!